Just updated the plugin, and it looks like your ‘numeric’ username fix has indeed worked. Thank you so much. Top support yet again. Thanks. Looking forward to it. Great service as always. Thanks for finding the issue. There’s been an update to S2Member today dated 130213, which I’ve just uploaded. Is this the one with the fix in it? Thanks Ronnie. I’ll see what happens tomorrow morning and if it backs up, then I’m sorted. Thanks for the help. I’ve done as you say and run a manual test, opened it and found it worked perfectly. The only thing I haven’t done is set up the cron job. Previously on other software, I’ve had to add a command to the cron jobs section in my cpanel. But looking at the wordpress dashboard summary, it indicates I have an active ‘job’ coming up tomorrow. I assume the backup will happen automatically and I won’t have to enter my control panel to set it up. Is that right? Please could you take a quick look to see I’ve set it up correctly and let me know what cron I should use. Thanks for your replies. I’ve not amended the standard WordPress set-up. In fact, I’ve had a look and I can’t find anywhere in the WordPress settings where I grant permission to edit_posts or not. Please can you show me where I look to find this. I’ve been doing some more analysis of the issue. It seems when I register users on http://www.sippclub.com with very short names, like those test ones listed earlier (eg u: 1111 p: clever ~~~ u: 222 p: password), the login goes to the profile page. Thanks Ronnie for trying. I’ll await the next ‘knight in shining armour’ to shed some light on this. Please could you let me know if I replace the whole of your old code beyond the last */ or just part of it. It will not override by theme upgrade. Over to the ‘official support’ then, please. Sorry Ronnie, this is language I don’t understand. I have no technical knowledge. I wouldn’t know what I was looking at, and I’d be worried about mucking up what is working. Logging in to older records (pre-last week) is fine – going straight to the welcome page. Since last week, it goes to the WordPress profile page. I’m sure it’s a relatively easy fix for people in the know. Thanks for your help though. They may do but I don’t want to lose the data I’ve been adding over the last week. I’d rather wait until Jason sorts out the problem. Thanks. Interestingly, I didn’t take a backup (although I do remember reading the warning). Whoops! … Please could you show me how to roll back to the previous installation of S2Member/Pro, just to check whether the recent update is where the problem lies. It seems I’m having a registration problem since the recent upgrade. It’s fair to say the upgrade might be a coincidence, but I, too, haven’t changed anything else and it was all working perfectly before then. For the record, I’m only using the free membership option and nothing else. Please can you help me sort out my problem. It’s causing difficulties with new members. Thanks for your reply. I can only assume the error you got was at Hostmonster, when the server was temporarily down. Sorry about that. I don’t use One-Time Offers – just the simplest form of free membership. I’ve followed your video, which like all of your videos was very clear, but I can’t find a ‘redirect_to’ anywhere on the login page. It’s a real mystery. Please can you check the logins above again (assuming Hostmonster plays ball) and then let me know what further thoughts you have. Thanks. This reply was modified 3 years, 11 months ago by Brian Bennis. I’ve just updated to WordPress 3.5.1 and the latest version of S2Member/Pro. Thanks Ronnie for your help. The only other thing that changed in the last two days were two S2Member updates, but I can’t believe it’s down to that. Hopefully, official support will be able to sort me out – they’re always absolutely brilliant. Thanks, Ronnie. I haven’t added any new plugins for some time so I don’t think it can be that. What I found within the last few days was when I looked at individual Users as the main administrator, was that in the Google+ box, it was adding my WordPress username and password. The only way I could remove these pre-filled fields this was to clear everything (using Chrome). I wonder if it’s cleared some key passwords or IDs within S2Member or WordPress. It seemed to remove the captcha code for signing up new members, but I’ve fixed that. It all seems to work OK, other than the member login not going to the right page. 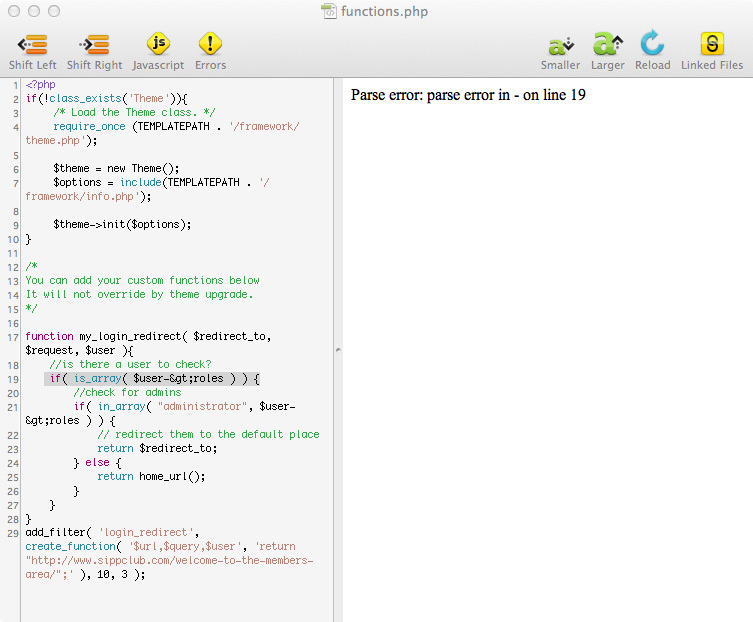 I’m sorry, I don’t know how to check rules within functions.php. Does any of this make sense to you?